You mean, all this time we could've been friends? If you are of my generation, then you know that Mean Girls was and continues to be one of the most iconic films of its decade. For both male and female audiences it remains one of the biggest inside jokes of our time. Aside from reinforcing pop culture with its bitchy one-liners and irresistible campiness, it was also the first stone to be tossed at a very real and very ugly glass ceiling. It was the first comment in a discussion, we as a society had yet to have, a discussion on the paradoxical relationship between women. Mean Girls portrayed the way women interact with each other in a much more raw and honest light than had ever been done before. It exposed the animalistic and sometimes cruel nature of females thoughts & actions towards one another. And while the film was released more than ten years ago, the message it conveyed is even more important now than it was then. As women living in a post-Trump era, it is vital that we stop tearing each other down to make ourselves feel better about our own insecurities. At a time where forces are trying to divide us more than ever, we must learn to view our fellow females as our allies and not our competition. Without that we have nothing. You see there are people that want us to hate each other, because if we are divided, we are easier to control. If we are not united, we can be manipulated. But it doesn't have to be this way, if we don't take the bait. From birth we are taught that our primary goal in life should be to find a husband, have children, and raise a family. We are told in words, reactions, and boundaries that have been engrained into our culture, that this is all we are good for, all that we are capable of. The problem with this, is that the bright little girl thats holding the cure for cancer in her brain, may not ever get the chance to share that knowledge with the world and save lives. Her parental figures, society, and the girls around her, are telling her that her dreams of being a doctor are "far-fetched" or "unrealistic". They are convincing her to take the much easier route of finding a man to take care of her instead of rising up and unlocking her full potential. To me, that is one of the saddest stories of all. She will never get to go to medical school, turn the key to the apartment she paid for herself, walk across stage holding the diploma she fought tooth and nail for, or make any of the miraculous contributions to the world that she has the ability to make. Because we have told her, that her time and energy are best served folding laundry and cooking dinner. That little girl is millions of women all over this country, sitting in tiny houses, watching day time television, drinking white wine while trying to convince themselves that they're happy. Meanwhile, holding the power to change the world and being completely unaware of it. Since we are taught that our biggest achievement in life should be the partner we catch, at a very young age we stop viewing other girls as friends, and start seeing them as our competition. And not in a friendly-competetive game of Scrabble way, its even more ruthless and blood hungry than you can imagine. This is where we as women stop living as our own independent person, and become puppets on a string. An example of this complex at its finest, was explored immensely on this past season Ryan Murphy anthology series "Feud: Bette & Joan". 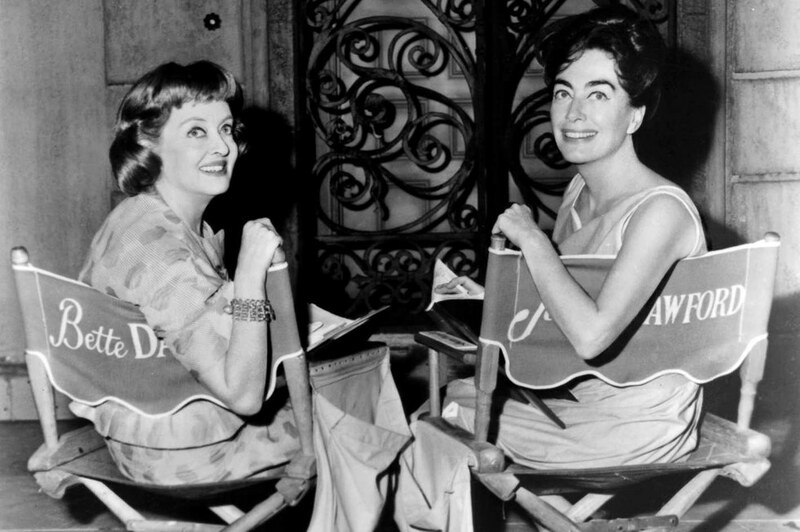 A story about the scandalous and iconic feud between movie royalties Joan Crawford & Bette Davis. What the world expected was a campy and sassy light hearted look at one of Hollywoods most notorious rivalries. What the world got was a series analyzing the sad and unfortunate circumstances that created and fueled their hatred for each other. The height of the story "Feud: Bette & Joan" tells, is revolved around the filming of cult classic, "Whatever Happened to Baby Jane?" starring both Davis and Crawford as the lead. This was at a point in both of their for careers where the casting directors had stopped calling. There were little to no roles for women of a certain age, something that still remains an issue in Hollywood today. There actually weren't many roles for women of any kind. And once they were too old to play "The girl next door" their options were narrowed down to nothing. Both Bette & Joan needed this picture to work, it was their last hope. Studio heads were are aware of this and took complete advantage. For marketing and publicity purposes, almost every single person working at the studio and on the picture (the majority of them being men) set the two upon each other so the rumors of their feud would create anticipation for the picture. But most of all, they were pitted against each other because they were afraid of how powerful they could be, if they joined forces. The men at the studio were intimidated by the idea of Crawford & Davis becoming friends, and possibly allies. So they did everything they could to keep them at each others throats. The other half of their rivalry, was the product of the natural animosity between females. They had hated each other long before they shot Baby Jane together and it was no secret. From the very start their relationship was pure competition, they had been fighting over both roles and the hands of men for decades. Each of them had something the other wanted. One of the most magical moments in the entire series, is the scene where Joan finally confronts Bette and in just a few short lines the entire message is presented. As Joan is walking away after the argument, Bette yells to her "Joan, how did it feel, to be the most beautiful girl in the world?". To which Joan replies "It was wonderful, the most joyous thing you could ever imagine and it was never enough." Joan then looks at her and says "What about you? How did it feel to be the most talented girl in the world?". The saddest part of everything that happened between the two is the fact they should have been friends. A fact Bette Davis acknowledged and discussed in the years leading up to her death. She admitted her regret for not being kinder to Joan and for failing to see how people were manipulating them into hating each other. One of Bette's final lines in the only picture the two starred in together, reads "So you mean all this time we could have been friends?" She often recalled the line as an ironic and sad summary of their relationship. The tale of Bette & Joan is several decades old now, but the cultural issue their feud represented, is still just as alive as it was back then. The rise of the internet and social media has brought the tension between girls to a startling new level. The negative side of platforms like Instagram, is the way we are receiving a constant stream of highly edited and unrealistic images of women. These kind of images evoke fear in us. Fear because we don't look anything like that. Fear that we'll end up alone if we don't look as perfect as the girls in those pictures. And from that fear, comes a response. This is where the issue resides. If you look closely, you'll notice when someone is responding to that fear, and you'll notice that most of the time that response is to pick on and point out flaws of the girl in the image, in order to soothe their own wounded ego. A classic case of two wrongs don't make a right. We see curvy girls, putting down girls on the thinner side claiming men don't want them because they're too small and they're somehow superior over them for having a fuller figure. We see cisgender women picking apart the identities of transgender women, out of the intimidation they evoke, they represent the threat of even more competition. We see girls putting each other down for absolutely everything under the sun, and its always in an attempt to make themselves feel better about their own insecurities. Girls say terrible things to each other day after day. And its such a sad thing. There is no reason why we shouldn't be friends. Each and every one of us has endless things in common with every girl in the world. We know the same pleasures, the same secrets, and the same pain. The only way for us to move towards a kinder and united relationship between women, is to stop comparing ourselves to them. That is the part thats spreading unhappiness. We have to stop telling ourselves that just because our contour isn't blended as nice as theirs, or our waist isn't as small, or our skin isn't that airbrushed, somehow means that we are inadequate to them. Because that thought is nothing but a nasty trick society has caused your brain to play on you. And the product of that trick is tearing young women apart, destroying their self confidence, and causing them to backlash at each other, completely dividing us. And now that we are divided like we've never been before, we are weaker, we are vulnerable, and the people in power know that. Because its exactly the way they want it. Women have the power to do incredible things. Femininity is almost magical. If we should ever unite, everything would change. Every glass ceiling we've been housed under for so long, would be completely shattered. We are powerful creatures and together we could shape the world to our liking. Just the thought of that though, terrifies some of our male counterparts. And with those male counterparts being the ones in power right now, what we are living is the response to their fear. To keep us at each others throats, to keep us from uniting. We will never get anywhere in our fight for equality, if we can't first practice love and kindness within our family of females. It's a direct contradiction of the task at hand. We have bigger monsters in our closet that need to be addressed. So speak kindly of and to your fellow females. Practice patience and understanding. Think of the wonderful things that we could of accomplished by now, had we stuck together. We have the power and love inside of us, to make the world a kind and compassionate place. And how beautiful it would be if the source of that peace, was the female spirit. Be kind to one one another. We could rule the world, if we didn't hate each other so much.